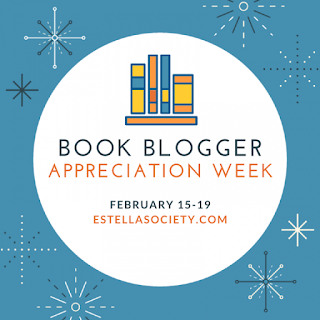 It is Day 4 of Book Blogger Appreciation Week, and the topic is staying connected to the community. I stay connected a number of ways, so let's see if I can name them all. I'm even going to try to step it up with listing my Top 5 Ways of Connecting! Some of these are social media platforms and others are events that I like to participate in regularly. 5. Bout of Books: I have discovered that in general week-long readathons work better for me than the shorter ones. I still like to participate in both, but this event usually draws a big crowd, creates a lot of great book chatter, and I tend to feel better about what I can accomplish in the time allotted. 4. Bloggiesta: I have been participating in this event since it was first created. I haven't made every single event, but I sure try to because it is a great way to maintain my blog on a regular basis, learn more about blogging in general, and chat with fellow bloggers. 3. Twitter: I love that you can connect with book lovers any time of the day or night on Twitter, and tons of fun chats happen via awesome events through this medium, and all in real time. 2. Book Bloggers Do It Better Facebook Group: I don't always join in the conversations here, but it is always guaranteed you can find good ones every week. My favorite is the weekly #fridayreads conversation, but there is so much more. 1. Instagram: I love books. I love photography. Instagram is the perfect platform to get a bit of both, and the inclusion of the thriving #bookstagram community, there is always plenty of conversation beyond the beautiful art of photography. I also have a very special mention that I have to single out -- Book Bloggers International! I didn't feel comfortable listing it in my Top 5 because I am very biased on this one, but I do believe it deserves to see the love! This website is dedicated to connecting book bloggers from around the world. We interview bloggers, we have bloggers guest write for our special themed months, we distribute a monthly newsletter with fabulous book blogger highlights, our personal favorite links from the month, and a list of giveaways happening around the blogosphere. And, I can't forget to mention our Book Bloggers Community Calendar for the go-to location in finding your next great event. If you haven't already discovered it, check it out now!! Other platforms or events that I also enjoy, even if they didn't make my Top 5 Faves are: Tumblr, Facebook, Goodreads, Dewey's Readathon, RIP Challenge, March Magics (formerly known as DWJ March), Seasons of Reading Readathons, and Google+. I know that there are so many other fabulous events and platforms out there, and despite my limited time, I'm always willing to check them out. I can't wait to see what others recommend. What are your favorite ways to stay connected to the community? How about I have seen the group listed several times and I totally forgot to even put it in my post? lol Thanks for including it, Tif! Becca Lostinbooks ... Ha! You're welcome! I love Book Blogger's International. :-) I love the idea of events like Bout of Books, but I never feel like I can give it my all or even keep up. Literary Feline ... Love the BBI love! ;) I can't keep up with some of the other bloggers on these events, but I'm okay with that. I set my own personal goals and just compete with those! You hit on so many goodies, and thank you for reminding me of the Book Blogger Community Calendar! Andi ... You're welcome! Glad I could remind you!